What climate change denialists gain by ignoring the complexities of climate science, not to mention, the climate system is most impossible thing to calculate. A recent apparent pause in surface temperature rises can be accounted for by deep-sea warming assisted by unusually high trade winds in the Pacific Ocean. (Photo: Getty Images)Global warming has not "paused." Climate change has not hit a "speed bump." The planet’s temperature is not remaining steady and it certainly isn’t cooling. Earth, especially its ocean, are heating up… and rapidly. According to the study, acceleration of Pacific trade winds has been twice as strong in the past 20 years compared with the prior 80 years and suggests the surface warming "hiatus" could "persist for much of the present decade if the trade wind trends continue." However, warn the scientists, when the winds return to their long-term average speeds, rapid surface temperature warming will resume and the consequences could be dire. "Sooner or later the impact of greenhouse gases will overwhelm the effect," said Matthew England, a climate scientist at the University of New South Wales in Sydney and head researcher on the project. "And if the winds relax, the heat will come out quickly. As we go through the 21st century, we are less and less likely to have a cooler decade. 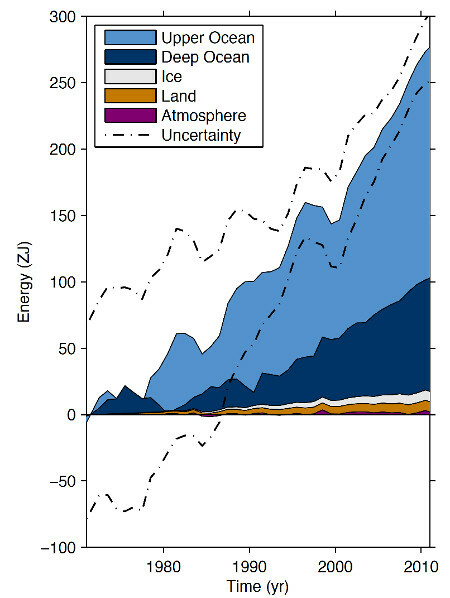 Greenhouse gases will certainly win out in the end."